Before starting this tutorial, ensure that you have a USB drive with at least 8GB of storage as well as a Leopard, or Snow Leopard retail DVD or disk image. Grey DVDs that were included with a Mac at the time of purchase cannot be used to make USB boot drives as they do not include drivers for Macs other than the computer it was shipped with. In this tutorial I will be creating a Snow Leopard USB install disk. The steps are the same to create one for Leopard. Start by launching Disk Utility on the Mac. To do this, you can either search for the application in Spotlight or find it in the Applications folder. Locate the USB drive on the left-hand side of the window and click on its name, not its partition. Click the Format drop-down menu and select Mac OS Extended (Journaled). Bear in mind that this will erase all data from the USB drive, so backup any important files before proceeding. To format the USB drive drive, click the Apply button in the lower right-hand corner of the Disk Utility window. In the center of the window you'll see two boxes: one labeled Source and another Destination. 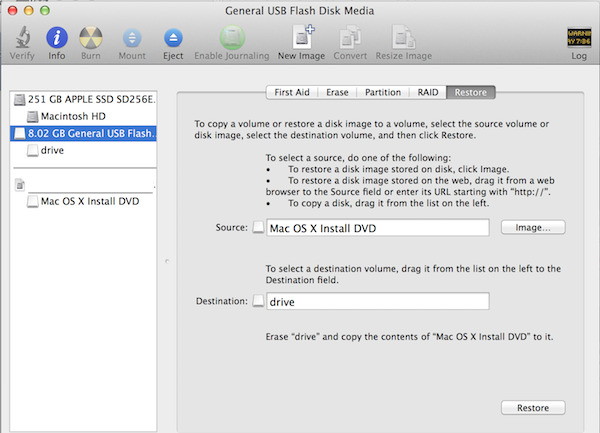 Disk Utility will restore the OS X Install DVD or disk image to the USB drive; this process may take anywhere from 20 minutes to an hour depending on how quick the Mac is. Now that you've created a Snow Leopard USB drive, let's use it to install OS X Snow Leopard as well as access Terminal, Disk Utility, and other OS X utilities. To install OS X Snow Leopard from the USB drive, you'll need to reformat the Mac's hard drive. To do this, look towards the top of the screen and click on Utilities from the top menu and then click Disk Utility from the drop-down menu. Please note that all data on the Mac's hard drive will be erased, so backup all important files before proceeding. OS X Snow Leopard may take a bit of time to install depending on the Mac's hardware. Upon completion, the Mac will restart and prompt you to create an account. Additionally, you can access Disk Utility, Terminal, Safari (to access Apple help articles. not general browsing) and other Mac utilities from the Snow Leopard USB drive. Boot the Mac to the USB drive using the steps shown above and click on the Utilities button from the top bar. You can access all available utilities from this drop-down menu. It's nice to have these utilities available to use from the USB drive, especially Disk Utility. For example, if you believe your hard drive has died or is corrupted, you can boot your Mac from the USB drive and use Disk Utility to check the the hard drive's SMART status and repair said drive. 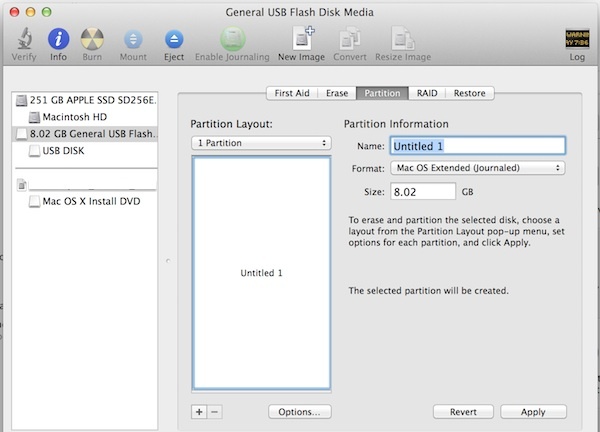 In this tutorial, I've shown you how to create a bootable OS X 10.6 Snow Leopard USB drive. You can now use the USB drive to upgrade, maintain and restore Macs to OS X 10.6.